When this post goes live the husband and I will be in Rome, Italy. In today's post I will be taking you through my toiletry and makeup bags. 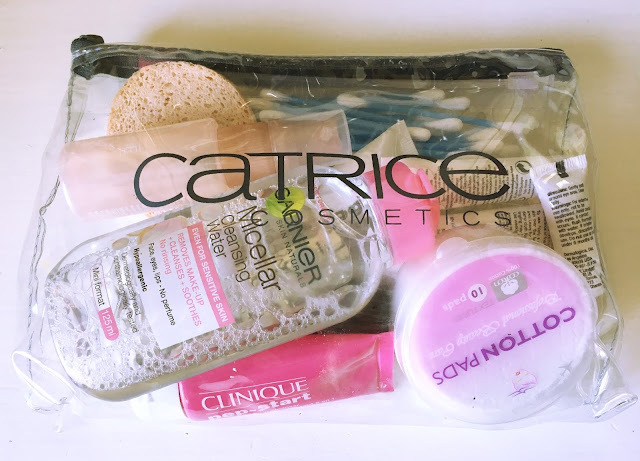 The toiletries fit into my Vichy travel bag and my makeup fits into a small Clinique makeup bag, win! I'm only packing minis and where I don't have minis I decanted the products into smaller travel containers. I also bought two new travel bottles which I am very excited to use, but more on that later. I managed to pack all my skincare into a handluggage sized clear plastic bag. I prefer to do it this way so I have all my skincare together in one place, and if something leaks, it doesn't leak into my entire toiletry bag. 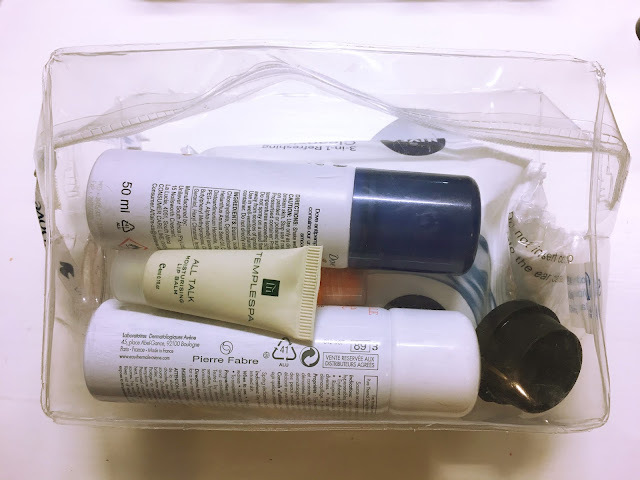 I normally take my Dermalogica travel kit with me, but some of the tubes are a bit on the empty side and I didn't feel like spending R800 on five minis... 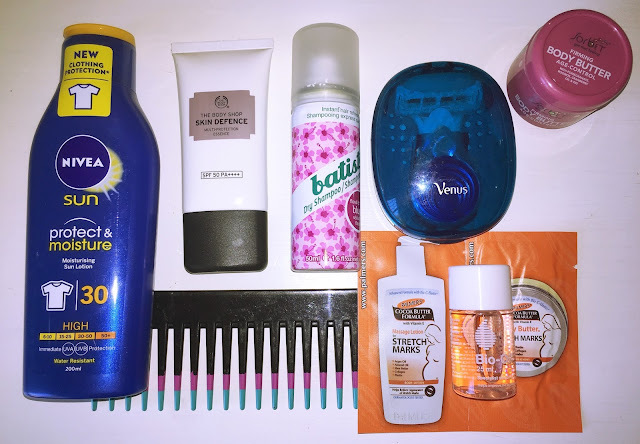 Instead I packed a travel size Clinique Pep Start 2-in-1 exfoliating cleanser (you can read about it here), mini Dermalogica eye cream with SPF, Dermalogica hydrating mist decanted into a Clinique bottle (do all Dermalogica spray bottles have horrible misters?? ), Dermalogica Active Moist moisturiser, mini Estee Lauder Advanced Night Repair serum (for nighttime), sample size Avène Hydrance Optimal serum (for day), mini REN Glycolactic Radiance Renewal mask, Garnier Micellar water travel size, a facial sponge, cotton earbuds (I used an old Catrice nail art packaging), and cotton rounds (I got the container at Dischem). I decanted shower gel (Nivea oil show cream) into a QVS travel bottle from Woolworths. 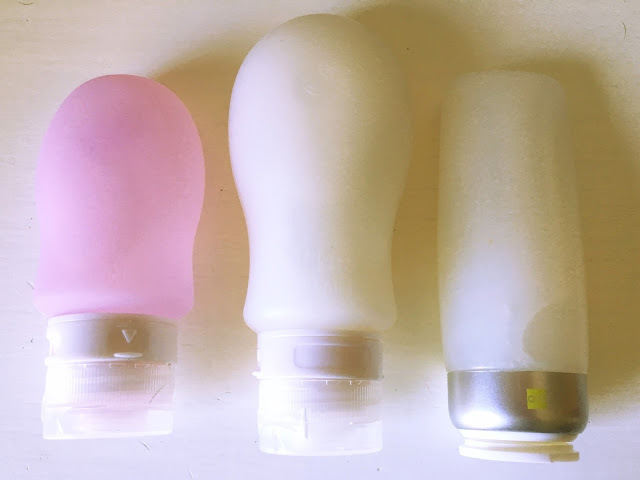 I used to have two of these (one for shampoo and one for conditioner), but the other one's cap cracked and broke. For shampoo and conditioner I have two silicone travel bottles from Clicks. They're squishy and leak proof and I'm very excited to use them. I'm thinking on doing a separate post on it after properly testing them. I decanted my Tresemme shampoo and conditioner into these containers. The larger bottle is obviously for my conditioner! 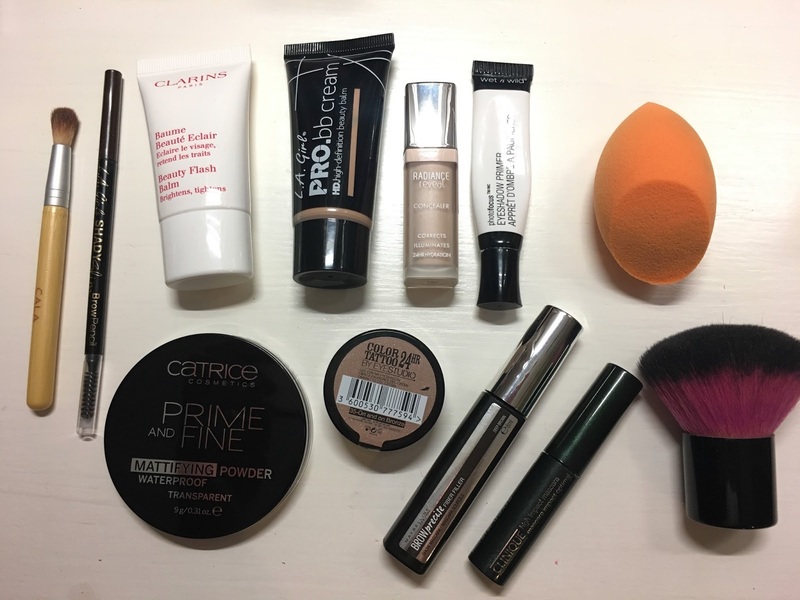 As for makeup, I'm pretty much packing the things that were in my previous monthly favourites post. Travel sized Clarins Beauty Flash Balm, L.A. Girl Pro HD BB cream in "Fair", Bourjois Radiance Reveal concealer in "02 Beige", Catrice Prime and Fine pressed powder (this is a new purchase but I have used it in the past), Real Techniques Miracle Complexion sponge, Wet N Wild PhotoFocus eyeshadow primer (I need to use this even if I'm not wearing eyeshadow), Maybelline Color Tattoo in "On and on bronze", travel size EcoTools blending brush, essence Kabuki brush, L.A. Girl Slim Shade brow pencil in "Brunette", Maybelline Brow Precise Fiber Filler brow mascara in "Deep brown", and a sample Clinique High Impact mascara. Not pictured is my essence Matte setting spray which I forgot to photograph. You'll see that there are no lip products. I only plan on taking one or two lipsticks and I'll only use them when we go out at night, so I'm still deciding what to take. Now this is a step that many people see as unecessary, but for me it is absolutely necessary. If I sweat a lot, or if the day just becomes too long, and I have mascara on, then my eyes start to sting and I just get miserable. Also, you'd take your makeup off before going to sleep at your house, so what's different when you're sleeping in the air? 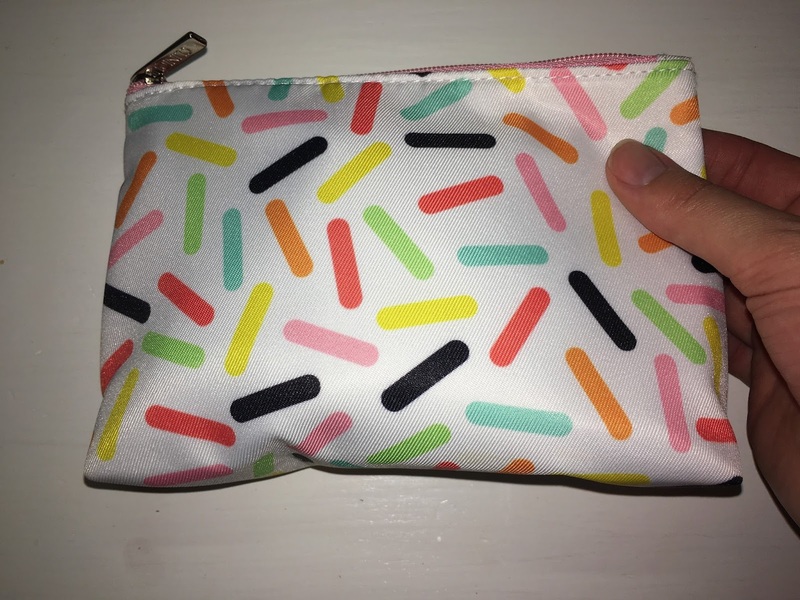 I packed another hand luggage sized plastic bag (this one had lots of Dove travel sizes in - I wanted a new one but couldn't find it at my Clicks). 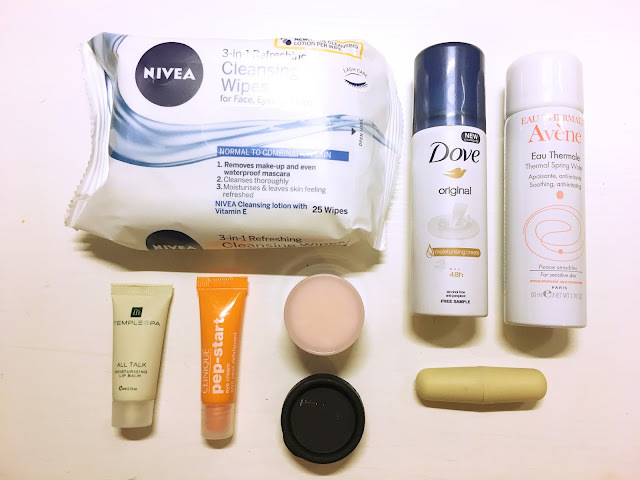 In it I packed Nivea 3-in-1 cleansing facial wipes, a travel size Avène thermal spray, travel size Dove deodorant (why don't they sell minis here?? ), earplugs, Elizabeth Arden Eight Hour Cream decanted into one of those small Lush sample pots, and a sample Clinique Moisture Surge Extended Thirst Relief moisturiser, and a travel size Clinique Pep-Start eye cream. When we're tucked into our seats on the plane I'll remove my makeup with a facial wipe, apply some eye cream, spritz my face, and apply some moisturiser. Lip balm is an important last step. Upon waking up the next morning I'll pretty much repeat the process, but maybe also splash my face with some water in the bathroom before applying my eye cream and things and then also brushing my teeth (they usually give us little travel pouches with travel toothbrushes and toothpaste on overnight flights). I am also taking medication (anti-clotting injections, prenatal vitamins, Panado's, nasal spray, Corenza Para-C, and Kentraxil) on the plane with me. As for entertainment I am taking magazines and my iPod. I'm also taking my Canon DSLR in a Lowepro bag. And that's it for my travel skincare, makeup, and in-flight bags! I hope I'm not packing too much but I also hope I'm not forgetting anything important!